Launched in 2001, Method was conceived by two former roommates to offer eco-friendly, safe and effective home cleaning products. Out to prove that being green is cool, chief brand architect,” Eric Ryan and “chief greenskeeper,” Adam Lowry, created a line of products in attractive, modern packaging that they refer to as “recyclable plastic art” — worthy of being left out on bathroom and kitchen counters. In the past, with Clorox Greenworks, we’ve argued that efficacy is important even when it comes to cleaning products, so we have to ask: Is Method truly green or does it hide behind cool packaging that attracts mainstream popularity? The company has been credited for “single-handedly turning the consumer packaged-goods industry on its head,” and justifiably so. Method only had $300,000 in start-up capital in 2003, but was making profitable revenues of $45 million by 2006. In 2002, the company effectively stepped into the mainstream with a distribution deal through Target, and also opened an office in the UK. In fact, before Greenworks came on the scene in 2008, Method held more than 60% of the environmentally-friendly cleaning market, and it continues to grow at more than 13% despite Clorox’s go at a sustainable line. So the question remains, considering that there are no current governmental standards on green cleaning products, what does Method do to ensure its efficacy and green self? For this particular analysis we’ll go inside-out. Every single ingredient in their formulas, including the packaging materials, are assessed and scored by the Environmental Protection and Encouragement Agency, an independent research institute led by Dr. Michael Braugart, author of Cradle to Cradle. Method has been recognized by Dr. Braugart and his team as a Cradle to Cradle company, a holistic way of creating products that Method has integrated into every part of the company. Method also works with the Design for the Environment (DfE) office of the US Environmental Protection Agency (EPA), which has recognized more than 50 of their products to be safe for people and the environment. Their packaging is not only cool, but it also carries a conscience. 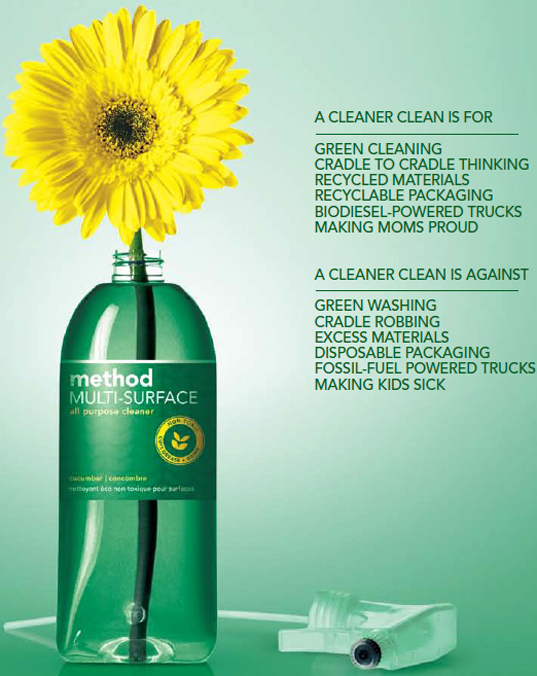 All of Method’s bottles are completely recyclable and made from 100% recycled plastic whenever possible. The design of the packages themselves is scored against Method’s very own “green card” program which ensures that the packaging design considers recyclability, packaging weight, reusability and compostability. Method’s greenness also seeps into company policies, as they are actively making efforts to be a completely carbon-neutral business and have purchased wind and solar energy credits to offset their carbon footprint. Their building is LEED-certified and has recycling and composting systems (with the worms to prove it) set-up throughout. They even offer financial incentives to encourage employee use of public or self-propelled transportation to and from the office. Finally, Method is beginning to look at their supply chain. They have additional financial incentives set in place for suppliers that employ sustainability initiatives including on-site renewable energy generation and the use of energy-efficient equipment. Additionally, they’ve formed partnerships with the largest contract carrier in the US to ship products in Method-branded trucks that run on biodiesel. With energy- and water-efficiency reporting programs in place at all factories, Method worked closely with one factory to find a way to recapture all process water, losing none of it down the drain. Yes, through and through, from company to product, Method can live up to the standards of dark greenies, while remaining trendy enough to attract thousands of Target consumers. I have used seventh generation, Maleluca, Clorox greenworks, and shackley (this probably spelled wrong) and I just recently used Method cleaner. Compared to the other all natural cleaners I have used Method has out performed them all. I am wondering if this product is as they say all natural plant derived ingredients. Methods bathroom cleaners are amazing in how they cut through soap build up, clean mold, toilets are left to a sparkling clean. Their cleaning products rinse away easily and completely. I love this product. Also, the fragrances of the products are wonderful and they don't have a strong lingering effect. I use these products for my house cleaning service and my clients are very satisfied with the end results and so am I. Yes and No. It contains Sodium Lauryl Sulfate, Lauramide Oxide, Decel Glucoside. There's many more just tired of typing. Need I go on? How can these ingredients be GREEN and/or OK for Human use? One might ask the questions: Where are their products made? Shipped? Labeled? What are their ingredients? Their packagin is cool, hands down however they fall short of the mark. #2 ingredient in their shower cleaner is sodium laureth sulfate: http://methodhome.com/shop/daily-shower-spray-refill/. This is a suspected carcinogen. #5 is benzisothiazolinone which the EWG considers a moderate hazard; also found in Seventh Gen products. Things may (or may not) have changed, but they used to bottle in Mexico, label in Canada and ship in the US. Not sure why they would do that, but it was their statement about operations in a feature article in Inc. magazine. Companies that use the "green marketing" tactic to sell products that contain dangerous chemicals are not doing the public, or truly green companies any favors. Froggie775 - great comment. I love Method products and I also rely on things like vinegar and baking soda for cleaning - as well as other homegrown antimicrobials. I concentrate what I normally use in cooking for it to have any kind of efficacy as a cleaner. I don't drink cleaners or spray them in my face because I don't imagine it would be pleasant. I don't serve them to guests either. :) On the other hand, I like to know that I can ingest small amounts of any of these products without great concern for my health. Children and pets eat or put into their mouths the things I clean, but they don't drink from the bottles. Nonetheless, I would not give them access to do so - even if the products were naturally derived and not particularly irritating - like Method products. Vinegar would cause irritation if you drank it in high concentration or volume. Eating thyme in great quantities will cause irritation; ginger can burn your esophagus! Natural - or naturally derived - doesn't (need to) mean weak. Plants are composed of compounds that are very powerful. Isolated and/or concentrated, these compounds can serve to do an assortment of things - from making an excellent cocktail syrup for a basil mojito to killing insects or treating diaper rash. How about... we just use good products *like we should, as they are intended to be used* and avoid the bad ones. And get to know your natural cleaners! @dream4green I would rather you "go on" because I don't agree with your "spray it in your face and drink it" statement. Baking soda, lemon juice and vinegar are examples of DIY green cleaners that I would not want to drink or have sprayed in my face despite the fact that I recognize that they won't kill me or cause me permanent physical damage. The issue is that when you use any of those ingredients in concentrations strong enough to actually CLEAN something (which is very different than the concentration you would use to cook with), each one of them will cause skin/eye irritation and digestive issues. I looked at your website and found it lacking in information. Seems to me like you're more interested in generating sales from the pyramid scheme products you offer. Interestingly, I can't find any ingredients lists for the cleaning products you offer - just promises that I should trust that it's completely non-toxic. Nice try. Just goes to show what a little thought and good design can do for a business. Launched in 2001, Method was conceived by two former roommates to offer eco-friendly, safe and effective home cleaning products. Out to prove that being green is cool, chief brand architect,” Eric Ryan and “chief greenskeeper,” Adam Lowry, created a line of products in attractive, modern packaging that they refer to as “recyclable plastic art” -- worthy of being left out on bathroom and kitchen counters. In the past, with Clorox Greenworks, we’ve argued that efficacy is important even when it comes to cleaning products, so we have to ask: Is Method truly green or does it hide behind cool packaging that attracts mainstream popularity?